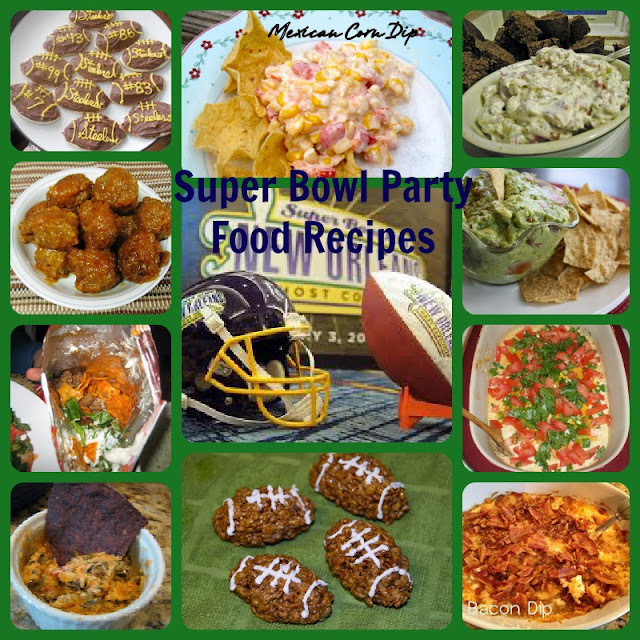 I have collected 13 of the best football party or Superbowl Party snack recipes from some friends in the Secret Recipe Club to share with you. They all look delicious so share them with your guests as suggestions on what to bring over!! When you think of football parties you most likely think of several dips from warm to cold varieties. Jessica from Vanderbilt Wife shares one of her favorite dips for Mexican Corn Dip she has nick named, magically delicious!! I have seen dried beef dip all over the Internet but have never tasted it before. Heather from Join us pull up a chair shares her favorite party foods – Dried Beef Dip. No football party is not complete with some chips and salsa. But making a football field out of homemade guacamole will make your guests smile. Check out Jamie from Our Eating habits version of guacamole. Erin from Making Memories with your kids… Touchdown Taco DipDebbi Does Dinner is sharing her… Healthy and Low Calorie: Pineapple Meatballs. Never knew you could use both those words together: healthy and meatballs. How about some homemade Corn Dogs on A stick from My Hobbie Lobbie. These are so cute and at least you get to know what you are putting into them. Some other of our favorite football game dip recipes include bacon Dip, and Spinach Dip Ole, all have been posted on here before. Even though your guests are snacking on all these wonderful dips, I like to make something of more subsistence to counterbalance all of those adult beverages consumed. One of my all time favorite party food is my Walking Tacos recipe. So simple but everyone seems to enjoy them and it makes you feel like you ate a meal instead of a bunch of snacks. Buffalo wings anyone? Some people, like my husband can make a meal out of them. Switch it around with Jennifer from Peanut Butter and Peppers as she shares her Buffalo Chicken Wing Wontons. Heather from Hessiz D’s Books and Cooks blog made these fun football decorated cookies. What are your favorite super bowl recipes? Delicious recipes for Super Bowl Sunday? Yes please! These are definitely different from just chips and dips. Ohhhh guacamole….now I’m so hungry! Thanks for all these great recipes! The pineapple meatballs and spinach dip look amazing, all of these are great ideas! Thanks!! pinning! what a great collection of recipes! Will be pinning this! Those look like some yummy recipes. Thanks for sharing. Thank you so much! You are to sweet!! 🙂 Love all the recipes! I must check them out! I LOVE Super Bowl Food!! thanks for sharing the recipes! Super bowl fun and food! everything looks so good! YUMMY! I will be making snacks for my boyfriend for the super bowl so I have bookmarked you! YUMMMM!! I can’t wait to use these recipes! I wish I was watching the super bowl at your house it sounds like you are going to have lots of goodies!! I don’t like football or watch the Super Bowl, but I’ll keep these recipes for when NASCAR starts!! Thanks Maria!! These are great ideas, they all sound yummy. Thanks for this list- I never know what to make for the Super Bowl! It all looks so good – my stomach is growling! I love the dips! Mmmm, bacon 🙂 And the pineapple meatballs make me happy, have to try that for dinner! Ooh, awesome! 😀 Now…if only I could get someone to cook them all for me 😀 Any takers? Thanks Maria! So many great ideas. I appreciate you adding our Touchdown Taco Dip =o) Now I’m off to drool at the others. Yummy-these all look amazing! Can’t wait for the playoffs! The guacamole looks sooooo yummy! These are a great collection of recipes! I will be making these this weekend for sure!